Quba is a fashion retailer producing a wide range of nautical-inspired clothing and accessories for both men and women. They have stores throughout the South East and sell globally through their online store. Quba were searching for a partner to provide support plus design and development work for their site. They also wanted to develop a new 'customise your own' area to allow users to customise select products. Their main objective was to introduce the new site area and to provide general site wide improvements to the way the site functioned for both users and staff. To gauge the success of our ongoing partnership Quba gave us targets of improved conversion rate and an increase in revenue. 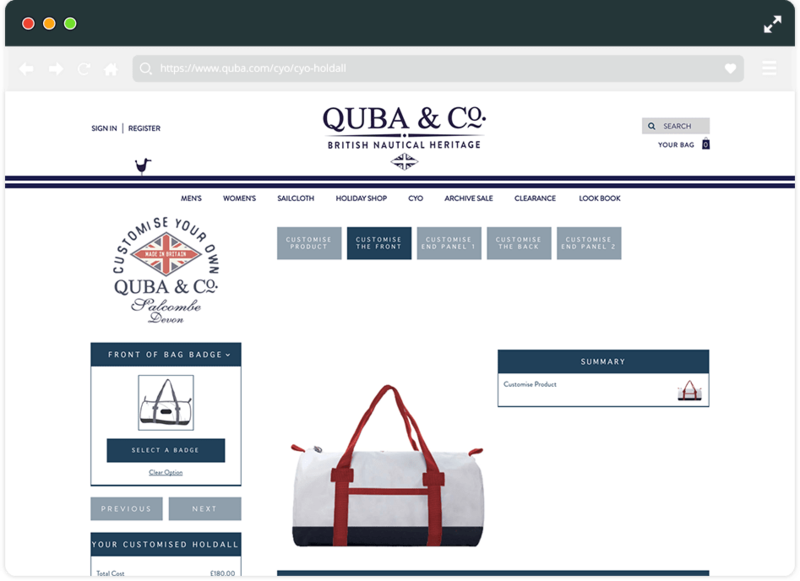 Work completed for Quba included the ongoing development of their Magento ecommerce website. This involved the introduction of the 'customise your own' product builder, a new product page design and improvements to allow the Quba team more control to add content and changes to the site. The builder was a great success, seeing a steady increase in sales from users. Customers who use the CYO page will spend 30% more than general site users, they are also 3 times more likely to convert than regular users. We set up and implemented Google Shopping Feed and managed their campaigns on an ongoing basis. Our work contributed to an improvement in mobile traffic of 26% and a cross device conversion rate increase of 16%.